Marketing can take many forms. You can use social media to promote your products, use Google Adwords for advertising, use promoted tweets for Twitter or sponsored posts in Facebook, write guest posts on top notch blogs with a back link to your site, and so on and so forth. The list is virtually endless. But there is one method of marketing which trumps all others. And that is when your customers recommend your business to their friends so that they too will come and buy from you. You see ads will be ads, no matter how you present them. People eye ads with a lot of skepticism. But if a friend whom they know and trust recommends a brand to them they will believe him. Now of course you need to provide excellent quality and excellent service if you want good recommendations from your current customers. I am not going to discuss all that in this article. Here I wish to explain a term which is crucial in order to get more people to bring in more customers to you. That term is viral coefficient. It is simple to define. A viral coefficient is a number which tells you how many customers each is your present customer bringing to you on an average. So this means if your viral coefficient is 2 then each of your current customer is bringing in 2 customers to your business. If it is 0.9 then each one is bringing 0.9, in other words 10 of your customers are bringing in 9 customers. How to calculate the viral coefficient? Take the number of your current customers. Let’s say that’s 100. Multiply this number by the number of invites your current customers send to their friends. If yours is an online business this shouldn’t be a problem. If it is offline you have some research to do to acquire the necessary stats. Let’s say you find that each customer invites 15 of his friends. Find the percentage of those invitees who became your new customers. Let’s say that’s 10%. So if 100 of your customers sent out 15 invites each that becomes 1,500 invites. Then if 10% of them became your new customers then that is 150 new customers. You started with 100 customers and you gained 150 extra customers. 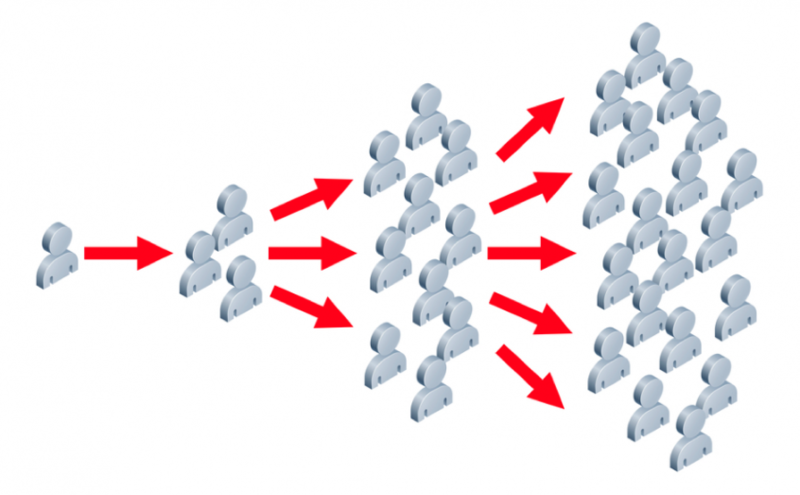 Divide the number of the new customers acquired by the number of existing customers and you have your viral coefficient. So in our case it will be 150/100 = 1.5. So our current business model has a viral coefficient of 1.5. Now of course if you want to have more customers, you need to increase this viral coefficient. As you can see from the calculations above, in order to increase this number you need to increase the number of your current customers; you want them to send out more invites; and you want a large percentage of those invitees to become your new customers. Then this cycle gets repeated with your new customers sending out new invites and a percentage of those invited becoming your new customers, then those new customers again sending out invites … you get the picture. At the very least your viral coefficient must be greater than 1. If it is less than 1 your business will stop acquiring new customers after some time. Why is this so? It’s simple if you think about it. Let’s repeat those five steps. A business has 100 customers. Each customer sends out 7 invites. 5% of the invited become new customers. So 100 people sent 7 invites, inviting 700 people in all. Since 5% of them joined so 35 more people joined. You had 100 customers and then you added 35 new customers. So 35/100 = 0.35. The viral coefficient is a mere 0.35 a number less than 1. Now see. Initially you had 100 customers. After they sent out invites, after the first cycle got over, you ended up with only 35 new customers. You can calculate it for yourself that when these new customers will send out invites the number of new customers acquired after the second cycle will decrease even further, and the numbers acquired after that cycle will go even down, and so on and so forth. Eventually you will be left with no new customers at all and hence you will have to spend more money on advertising to acquire new customers. You see how important this number is for your business? Ensure the viral coefficient is above. There are two important things to take care of when calculating viral coefficient. 1) Acquisition – Note in the calculations above the number that plays an important part is the number of people who are actually becoming your new customers or the number of acquisitions. If each of your customer sends out 200 invites but none of them joins, your viral coefficient will be 0. So be careful which numbers you are dealing with. 2) Be realistic – It is unlikely that a customer is going to invite his friends repeatedly. So ignore the number of old customers from the new cycles. Don’t live in a world of fairy tales. I hope this article would have helped you understand this vital number in your business. Let me know in the comments below if you have any questions or comments. But you’re not even calculating in churn. With a churn rate of 30% on active users, which is normal, what would your coefficient need to be to sustain growth? Note I said active, not registered users for a reason. Do you think all apps and software can have a co-efficiency greater than 1 if the strategy is thought through enough? We’ve got an app, Dokka, that lets you use AI to take all your gmail documents and paperbased documents and have them instantly sorted into a “smart dropbox”. Would virality work on a system like this?